Wheelchair casters come in a variety of diameters and widths and each different style and size will have its own attributes that make it appropriate for different applications. The purpose of wheelchair casters is to stabilize the wheelchair while the drive wheels (powered wheels on a power wheelchair & large handrimmed wheels on a manual wheelchair) propel the wheelchair. The casters are usually located at the front of the wheelchair but on wheelchairs where the drive wheels are in the center or front of the wheelchair the casters are usually located at the rear of the wheelchair. Caster load (the weight on the casters) is a factor that affects the ability of the casters to roll over obstacles and the lower the caster load the smaller the casters can be and still function well. Caster load has a greater effect if the casters are located on the front of the wheelchair regardless of whether the wheelchair is electric or manual. Caster loading is a factor that experienced wheelchair technicians take into account when setting up a wheelchair for a user, if possible, try to find an acceptable load level for function. The diameter of wheelchair casters can range from 3" for some rigid sports chairs to 12" for extreme rough terrain wheelchairs with the most common diameters being 6" and 8". Generally the larger the caster diameter the easier the wheelchair will be propelled over obstacles and rough ground. On the other hand, the smaller the caster diameter the easier the caster will swivel and the more responsive the wheelchair will be when turning. Based on this, one would think that the little 3" casters would be almost impossible to use outdoors however because the type of wheelchairs that use the tiny casters have their center of gravity centered on the rear wheels and there is very little weight on the casters. Caster width is another factor that affects how a caster will roll over rough terrain. The wider the caster tire, the easier rough terrain can be travelled over. Most manual wheelchair casters are around ¾" wide with 2" being considered wide and power wheelchair casters can be between 2" and 4" wide. The heavier the combined weight of the wheelchair and the user, the wider the the casters have to be to prevent them from sinking into soft terrain and to enable the wheelchair to roll over obstacles. 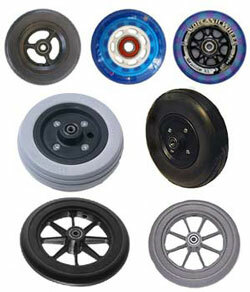 There are three types of wheelchair tires for casters, air filled, solid and foam filled or flat free inserts. The tires on the casters can be a huge factor on how easily the wheelchair will roll over all terrain. Generally the harder the caster tire, the easier the wheelchair will roll and turn corners. The softer the caster tire, the harder it will be to propel the wheelchair and the harder it will be to turn the wheelchair. Air tires are not terribly common but they will roll over soft terrain easier the solid tires. Although air tires are available on casters as small as 6" in diameter I never recommended them for tires less than 8" because the smaller the caster, the easier the tire goes soft and the harder it is to refill the air tire. Solid tires are the best caster tires for those who want a wheelchair to roll and turn as easy as possible but they give the roughest ride over bumps and ridges in the ground surface. The biggest advantage is they are virtually maintenance free and they won't go flat and won't likely wear out in the life of the wheelchair. Foam filled or flat free inserts are basically air tires that have a semi-solid core. The advantage is they will stay harder than air tires and not be subject to flat tires but still give a bit softer ride than a solid tire. This type of caster tire will wear out over time and have to be replaced on wheelchairs that have heavy use and would be considered a compromise between air filled and solid caster tires.